Just like other languages of the world, Punjabi literature also started with poetry. Punjabi poetry is very old and some of its earliest poets were Charpat Nath (840 A.D.-940 A.D.), Gorakh Nath (940-1031), Pooran Bhagat (970-1070) and Shah Shams Sabzvari (1165-1276). However, Baba Farid (1175 A.D.-1265 A.D.) is regarded as the first regular poet of Punjabi, born at Kothaywal near Multan. He travelled widely in search of knowledge and after getting spiritual training from Khaja Bakhtiar Kaki in Delhi, he finally settled in Pak Patan. His poetry has been preserved in the form of Shaloks. Afterwards, Ameer Khusru (1253-1325), Shah Miranji (1400-1496), Burhanuddin Janam (1586) and Guru Nanak (1469-1534) spread the message of the Oneness of God in Punjab through their poetry. Later on, Ibrahim Farid Sani (1450-1575), Damudar Das (sixteenth century), Shah Husayn (1539-1599) and Nosha Ganj Bakhsh (1452-1554) made their contributions to Punjabi poetry and literature. Shah Husayn introduced the genre of Kafi in Punjabi, while Sultan Bahu (1632-1692) laid the foundation of another genre called Se-harfi. From Baba Farid to Guru Nanak and all the other poets expressed mystical views in their poetry. In the subsequent period, Bullhay Shah, Ali Haidar, Khaja Fareed and Ameer Baloch continued the same tradition. Besides mystical themes, romantic and amorous affairs were also discussed by some other poets. Damudar Das is the first Punjabi Romantic poet who for the first time wrote the romantic story of Heer Ranjha during the reign of Akbar. Afterwards, the same story was written by Ahmad Kavi, Charagh Awan, Pilu, Hafiz Shah Jahan Muaqbal, Waris Shah, Hamid Shah Abbasi, Fazal Shah, Bhagwan Sing, Imam Bakhsh, Maula Bakhsh Kushta and several other poets. The story of Mirza Saheban was for the first time written by Pilu. Later, Hafiz Barkhurdar Ranjha and Muhammad Yar Aleel also wrote on the same subject. Barkhurdar also wrote the stories of Sassi Punnu and Yusuf Zulaikha. Fazal Shah acquired fame by writing the story of Sohni Mahinwal while the story of Sassi Punnu written by Hashim became famous everywhere. Maulvi Lutf Ali Bahawalpuri, Mian Muhammad Bakhsh and Makhdoom Muhammad Bakhsh wrote the story of Saiful-Mulook. Imam Bakhsh wrote Badi-ul-Jamal and Shah Behram, etc. In the same way, Munshi Khahish Ali wrote Sohna Zeni and several other stories and thus made genuine contribution to enrich Punjabi poetic literature, further. Punjabi literature was formally started with the inspiring poetry of Baba Farid. Later, Guru Nanak composed his poetry on similar lines and used it as a vehicle for the spiritual improvement of the people. However, the Punjabi religious literature began when (during the reigns of Jehangir and Shah Jahan); Maulvi Abdullah Abdi wrote his twelve religious pamphlets known as Bara Anvaa. These twelve religious pamphlets are: Tohfa, Nas-o-faraez, Muamlat, Uloom, Marfat-e-Ilahi, Khabirul-Aashiqeen Kalan, Khabirul-Aashiqeen Khurd, Siraji (meeras), Hisarul-Iman, Sekal Avval, Sekal Dom and Tohfa-e-Jadeed. Maulvi Abdul Kareem Jhangvi completed his famous pamphlet named Nijatul-Momineen. In 1104 A.H (1702 A.D). Maulvi Habib-ul-lah Faqeer wrote a book called Akhbarul-aakhirat. During the same period, Abd-ur-Rehman Minhas wrote a number of religious books, such as, Tafseer-e-Muhammadi in seven volumes and Zinat-ul-Islam in two parts. Through their writings Maulvi Muhammad Muslim, Ahmadyar Maralvi, Maulvi Noor Muhammad, Abd-us-Sattar, Fazal Shah, Mian Muhammad Bakhsh, Ghulam Sarwar Lahori, Maulvi Habib-ul-lah, Maulvi Dilpazeer and Abdul Kareem Samar carried forward the same tradition and this process continues even today. In this connection it is worth mentioning that some writers added to the bulk of religious literature in Punjabi by writing religious books in which the word “Rottian” was used. Thus, they wrote books such as, Mitthi Rotti and Pakki Rotti. We have already mentioned two religious books named Aizid Bari and Allah Bari. The word Bari was used in certain other religious books such as Khaliq Bari and Raziq Bari. In the same way, the word “Anvaa” was also used by a number of poets and writers in the title of their religious books. Thus we find Bara Anvaa, Anvaa-e-Barkhurdar, Anvaa-e-Muhammadi and Anvaa-e-Barakullah, etc. Another commonly used word for religious books was “Shariat”. Thus, we have Shahbbaz-e-Shariat, Charagh-e-Shariat, Khursheed-e-Shariat and Ma'ad-e-Shariat, etc. Gulzar is that genre of Punjabi which describes the life of prophets, saints and other prominent religious figures for instance, Gulzar-e-Adam, Gulzar-e-Yusuf, Gulzar-e-Nooh and Gulzar-e-Moosa, etc. Punjabi newspapers and magazines played a considerable role in the evolution of Punjabi literature. “Hindu Parkash” is regarded as the first such newspaper. It was brought out in 1873 from Amritsar and was written in Gurmukhi style of writing. Afterwards, several Punjabi newspapers and magazines continued to be published till the birth of Pakistan through the efforts of Hindu and Sikh editors. These included, Khalsa Akhbar,Khalsa Gazette, Singh Sabha Gazette, Amrit Patrika,, Bazm-e-Sho’ra, Young Man Magazine, Paritam and Sarang, etc. In 1928, Joshua Fazal-ud-Din started “Punjabi Darbar” from Lyallpur (Now known as Faisalabad.) Like Sarang and Bazm-e-Sho’ra, it was a literary and scholarly newspaper. In the fourth decade of the twentieth century, Charan Sing Shaheed brought out the first humorous magazine called “Maojji”. Another worth mentioning work was done away from Punjab in West Bengal. Sodagar Sing Bhikari brought out a literary newspaper named “Kavi” from Calcutta. (2) After the creation of Pakistan, Punjabi, Punjabi Zuban, Lehran and Punjabi Adab played a crucial role in the development of Punjabi literature. Monastic system and fairs also made a considerable contribution to the development and promotion of Punjabi literature. Most of the Sufis were poets and writers. Their devotees and close acquaintances listened to their poetry and communicated it to others. Moreover, on the occasion of fairs, story tellers, singers, book sellers and buyers of books became a source of spreading poetry and literature among the masses. Muslims, Sikhs and to a certain extent, Hindus used Punjabi language as a vehicle for the spread and promotion of their religious literature. After the advent of the English in the Sub-Continent, Christian missionaries also became active in this region. The Torah, the Psalms the Bible, religious sermons, plays and other religious books were translated into regional languages. Some priests wrote their own books, in these languages and tried to popularize them in the local people. In the beginning, these books were distributed free of cost and later; they were sold at a nominal price. In this way, like Muslim and Sikh religious literature, Christian religious literature also became a part of Punjabi literature. We divided the process of research into several types such as, explanatory, narrative, exploratory, interpretive, literary, natural, complete and technical. After this division, we discussed the various benefits and results of these numerous forms of research. To make its objectives clear and explicit we examined the different technical styles that can be used for it. Research has three main forms or dimensions. The first of these is related to the biographies and literary histories which help us understand the background and past of literature in a better way. The second dimension of research is related to linguistics in which the history, evolution, grammar and structures of the language are discussed. This aspect of research also embodies the knowledge of diction. The third type of research deals with the work of editing, compilation and translation. In this type of research, an old text is edited, its old spellings are changed in accordance with the requirements of the new age and the text is published along with explanation and glossary. At other times, some scattered works are compiled and published together. In all these fields of research, work is being done in Punjabi. According to Akhtar Waheed, after their advent into this region, the English Christian missionaries published an elementary book of Punjabi but it is not available now. Later in 1833, Muhammad Fakhruddin Razi Qazi also wrote an elementary book. In 1843, the followers of Ubaid-ul-lah Sindhi wrote an elementary book of the mother tongue of the state. In 1944, a committee consisting of the experts of Multani language added six more alphabets in this language. (5) Carey died in 1834 and in the same year, another missionary group set up its centre in Ludhiana. A priest named John Lorreey was the head of this centre. In December 1835, James Wilson and John Canoti also arrived there for his assistance. A considerable work was done by this mission and later on, they set up their branches in the cities of Jalandhar, Ambala, Hoshyarpur, Ferozpur and Rawalpindi. Besides using the Gurmukhi style of writing, they published their missionary literature in the Shahmukhi or Persian style of writing. (6) Members of this mission worked for the general understanding of the language, in order to teach Punjabi to the English officers and to convert the local people to Christianity. They compiled ordinary type of grammars and dictionaries. In 1849, with the help of Basava Singh, S.C. Starkey compiled Punjabi dictionary and grammar. Later, in 1851, by writing Grammar of the Punjabi Language, John Newton tried to promote and upgrade research work in Punjabi. He also benefited from Carey’s Grammar. It is worth remembering that while compiling the grammars and elementary books of Punjabi, such Western intellectuals gave more importance to the rules of English than the rules of the local Indian languages. They gave information about grammar after the description of noun, pronoun, verb and adjective, etc. In 1854, Newton got published the Punjabi dictionary. John Newton’s work became a standard for the subsequent researchers. In 1896, his own son A.P. Newton expanded his father’s grammar and named it Punjabi Grammar with Exercises and Vocabulary. Captain Starkey compiled the first dictionary of Punjabi. It was based on the rules of English dictionaries instead of the rules of Arabic and Persian. In this way, Starkey’s work founded a tradition and later, a number of dictionaries were compiled on the Ludhiana accent. Afterwards, dictionaries of the languages spoken in Lyallpur, Hafizabad and other regions were prepared. Most of these books were published in the Gurmukhi script. They did not have purely literary objective. They were mainly published for religious and missionary purposes. The language used in them is spoken rather than scholarly. However, in the twentieth century, the English rulers started paying attention towards folk literature. When their interest increased in Punjabi culture, in 1854, R.C. Temple compiled Legends of the Punjab in three volumes. A total of 59 stories have been collected and published in these three volumes. War is a genre of Punjabi poetry. Several “Wars” were compiled and published separately. For instance, the War of Nadir Shah written by Najabat was published from Lahore by Sir Maclagin. Charles Frederick Osborne published a book named Sufi Mystics and Poets of the Punjab. Dr. Lajwanti Rama Krishana brought out a somewhat changed version of this book. R. Luther published Mystic Poets of the Punjab. The Story of Heer Ranjha was published by Osborn in 1923. Thus it can be said that people like Carey, Starkey, Newton, Graham Bailey, Thomas Commings, George Grierson, R.C. Temple and Osborne, etc. played a fundamental role in the development of research and criticism. Their work served as an impetus for new research in Punjabi. The local people did not appropriately build on the work, initiated by the English scholars, at that time. Yet, their work inspired the natives of Punjab to step into the field of research and criticism. Among the local people, Bihari Lal was the first to write a grammar named “Punjabi Viakran” in 1869. Sirajuddin Quraishi compiled the poetry of Shah Murad and published it in 1908, with the title “Gulzar-e-Shah Murad.” From 1916 to 1926, Bava Budh Singh brought out a number of books including Koel Ku, Hans Choag, Bol Banbiha and Prem Kahani. Dr. Mohan Singh Diwana wrote “A History of Punjabi Literature” and compiled Heer Waris Shah in 1945. In 1938, Lajwanti Rama Krishana published his thesis of D. Lit as “Punjabi Sufi Poets”. Later, in 1941, Dr. Banarsi Das Jain published “Punjabi Language and Its Literature.” At the same time, people like Hafiz Mahmood Shirani and Fazl-e-Haq also worked on similar lines. These distinguished researchers deviated from the track of the Western intellectuals and earlier researchers and built their own tradition of research and criticism in Punjab and Sub-Continent. Today they are known as the pioneers and founders of this tradition. At this point, it should be kept in mind that till now, research and criticism are going on hand in hand together in Punjabi. Keeping in view the requirements of the time, they should become separate and distinct from each other. However, at numerous points in this thesis, we shall mention those books which are critical as well as research oriented at one and the same time. The writers of these books did not bother to create a distinction between these two fields. This process did not start all of a sudden. In fact, it was the continuation of the process that had already begun. As mentioned earlier, on account of their profound love for Punjabi language and literature, Hindu, Sikh and Jain intellectuals such as Dr. Lajwanti Rama Krishana, Dr. Banarsi Das Jain and Dr. Mohan Singh Diwana, wrote their thesis for Ph. D. and D. Lit. These Theses were then published in the form of books. At the same time, Muslim scholars such as Hafiz Mahmood Shirani and Qazi Fazl-e-Haq, etc. and Christian intellectuals like Joshua Fazl-ud-Din were also busy in research, criticism and editing. We shall now throw light on the research work initiated after the creation of Pakistan. For our convenience, we have divided this work into five parts: histories and biographies, research in educational institutions, literal & linguistic research, compilation and scattered research. After the birth of Pakistan, the first research oriented (and critical) book came out in Urdu in 1953, from Karachi. It was written by Muhammad Sarwar and was titled “Punjabi Adab.” Later, in 1956, Abdul Ghafoor Quraishi published “Punjabi Zuban da Adab tay Tareekh.” It is a historical and biographical book. In 1959, M. Sultan Mahmood published a book in Urdu. It was called “Punjabi Shah Paray.” Maula Bakhsh Kushta’s “Punjabi Shairan da Tazkra” was published in 1960. Besides throwing light on the history of Punjabi language, poetry and literature, this book describes the life of more than three hundred poets along with the specimens of their poetry. In 1962, Bashir Ahmad Zami published “Bahawalpuri Multani Zaban-o-Adab.” In its essence, it is also a historical and biographical book. In the same year, Shamim Chaudhry published “Punjabi Adab-o-Tareekh” in Urdu. In 1964 came “Punjabi Adab ki Mukhtasr Tareekh” by Ahmad Husayn Qaladari. In 1971, University of the Punjab published “Urdu Daera-e-Maaraf-e-Islamia”. The fifth volume of this book contains a long essay on Punjabi language and literature. In 1971, the 13th and 14th volumes of “Tareekh-e-Adbiat-e-Musalmanan-e-Pakistan-o-Hind” were published by the same institution. These volumes have a number of articles on the Hindko and Siraiki accents of Punjabi. In 1972, Abdul Ghafoor Quraishi revised his book “Punjabi Zuban da Adab tay Tareekh” and after making some changes and additions into it, he published it as “Punjabi Adab di Kahani.” Later, in 1973, Iqbal Salah-ud-Din published “La'lan di Pand” which is a collection of critical and research oriented articles. In the same year, Serebriyakove’s book was published in Pakistan, with the title “Punjabi Literature - a Brief Outline. This book which was originally published from Moscow views Punjabi literature in its social perspective. In 1977, Ghulam Mustafa Bismil completed a biographical book in verse, named “Maillay Mitran day”. In 1981, Azra Waqar published a book “Waris Shah: Ehad aor Shairi”. In 1986, Sajjad Haidar Parvez wrote “Siraiki Shairi di Mukhtasr Tareekh.” Another biographical book in verse was published in 1987. It was Naadim Asri’s “Taray Neel Gagan day”. In 1991, Salim Khan Gimmi published his research oriented book “Punjabi Zuban da Irtiqa”. Hameed-ul-lah Hashmi brought out “Punjabi Adab di Mukhtasr Tareekh” in 1992. In 1993, Javed Ghanjira published his Master’s thesis with some changes. It was called “Phull Karanabar day”. Two years later, in 1995, Mukhtar Ali Nayyar published “Tareekh-e-Zaban-o-Adab-e-Hindko”. Like “Siraiki Shairi di Mukhtasr Tareekh”, it is a good book on the history of the Hindko accent of Punjabi. Among all the educational institutions of Pakistan, Punjab University Lahore was the first to pay formal attention towards the teaching and research on Punjabi language and literature. In 1970, the department of Punjabi was opened at the university and in 1972, 21 theses were written at the Master’s level. The first of these was written by Waheed Sultan. Its title was “Mehar Ali Shah di Hayati tay Shairi”. After this, research work was started at the Master’s level not only at the Punjabi Department of the Punjab University but also at the History, Islamic Studies, Journalism, Philosophy, Pakistan Studies and other departments of other universities. Four Ph. D. degrees have been issued by Baha-ud-Din Zakariya University Multan and one by Islamia University Bahawalpur on different topics in this field. Yet, in the real sense of the word, research work on the Ph. D. level in Punjabi is being done up to this day, only at the University of the Punjab. In 1982, the first two Ph. D. degrees were issued by the Punjab University. The recipients of these degrees were Dr. Shahbaz Malik and Dr. Akhtar Jafri. Till the year 2000, 30 Ph. D. degrees were issued by this university. About 250 research theses have been written at the Master’s level by the students of this and other varsities. After 2000 Punjab University, Lahore and Lahore College University, Lahore issued the degrees of Ph. D in a big quantity. Most of the said research works done under patronage of single guide of the University. As speed of the issuance of degrees in these years was increased the standard of research was decreased naturally. Bashir Ahmad Zami’s book “Siraiki Zuban ka Irtiqa” published in 1970 was the first book on the proper understanding and use of language. Ainul-Haq Faridkoti’s book “Urdu ki Qadeem Tareekh” was published in 1972. According to this book, Urdu originated from Punjabi while Punjabi originated from Darawari language. In 1976, Dr. Shahbaz Malik published his book named “Munh Aai Gall”. It is a research study of Punjabi in the light of the political conditions of the Sub-Continent. This book claims that Punjabi has its similarities not with the Indo-Arian family of languages, but with the Darawari family. Thus for the real understanding and identity of Punjabi, it should be linked to the Darawari languages instead of Sanskrit. In the same year Muhammad Asif Khan, Sibtul-Hasan Zaigham and Sharif Sabir collectively published “Mudhli Lafzali”. In 1977, Dr. Shahbaz Malik published another book on linguistics with the title “Punjabi Lisaniyat”. This book is a review of the Punjabi language in the light of the modern rules of linguistics and the roots of this language have been traced with the help of its suffixes, prefixes and other such aspects. Again in this book, Dr. Malik has repeated the theory of Punjabi’s similarity and relationship with Darawari family. In 1976, in collaboration with Umar Kamal Khan, Aslam Rasoolpuri published, “Siraiki Rasmul-Khat di Mukhtasr Tareekh”. In 1980, he alone published “Siraiki Zuban, Ohnda Rasmul-Khat tay Avazan”. “Pak Punjabi” by Mushtaq Basit, published in 1978, is another book written from the linguistic point of view. It examines the cultural and linguistic heritage of Punjab in the Islamic and Pakistani perspective. On the basis of an ideological research, it presents the concept of Pakistani Punjabi with reference to the two-nation theory. In 1974 was published Iqbal Salahuddin’s book “Punjabi da Rasmul-Khat tay Imla”. It is an orthographic study of Punjabi. Later, in 1985, Mehar Abdul Haq’s “Mazeed Lisani Tehqeeqan” was published. It discusses the linguistic issues with reference to the Siraiki aspect of Punjabi. Dilshad Kalanchvi’s “Siraiki Lisaniyat” was published in 1990. In 2005 Dr. Nasir Rana’s books titled “Kujh Lisani Mas’lay”, “Punjabi” and “Punjabi Imla” were published. A considerable amount of scattered work has also been done on linguistics. Thus people like Professor Sami-ul-lah Quraishi, Dr. Muhammad Baqir, Sardar Muhammad Khan, Dr. Waheed Quraishi, Saeed Abid, Muhammad Asif Khan, Dr. Ghulam Ali Alana, Abdul Jabbar Nasir, Suhindar Singh Bedi, S. Khanam, Sibtul-Hasan Zaigham, Noor Kashmiri, Anwer Aman, M. Masood and Saeed Karim, etc. wrote articles and research papers in “Waris Shah”, “Panj Dariya”, “Lehran” and “Punjabi Adab”, etc. In the mean time, eighteen Punjabi elementary books were also published. We have already mentioned the work of the orientalists on Punjabi dictionaries. Later, in 1971, Irshad Ahmad Punjabi’s “Punjabi Lughat” was published. This Punjabi into Urdu dictionary consists of the first two letters of the Punjabi alphabets (Alif and Bay). “Punjabi Nama” written by the same writer had already been published in 1969. Later in 1974, he published another dictionary named “Urdu Punjabi Dictionary”. Afterwards, only the “Alif” strip of S. Khanam’s “Punjabi Urdu Lughat” was published. In the same way, Dr. Muhammad Baqir started “Punjabi Angrezi Lughat” which could not be completed. In 1974, another dictionary named “Haft Zabani Lughat” was published by Markazi Urdu Board Lahore. It includes the major languages spoken in Pakistan, such as Punjabi, Kashmiri, Bengali, Balochi, Sindhi and Pushto. On the other hand, “Lughat-e-Siraiki” was compiled by Muhammad Bashir Zami. In 1980, Fida-e-Athar and Aslam Quraishi together wrote “Navekli Siraiki Dictionary”. It is also an incomplete work. In 1981, a prominent researcher Dilshad Kalanchvi published “Lughat-e-Dilshadia” in two parts. Its first part is from Siraiki to Urdu while the second part is from Urdu to Siraiki. In the same year of 1981, Punjab University’s Department of Punjabi published Sharif Kunjahi’s compiled dictionary titled “Mukhtasar Punjabi Lughat.” The main distinction of this dictionary is that for the first time in Pakistan, it has given the meanings of Punjabi words in Punjabi. In 1982, Sardar Muhammad Khan’s “Punjabi Ucharan Dictionary was published. 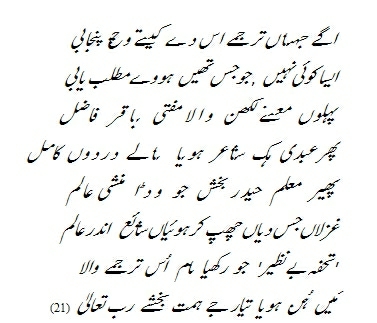 “Punjabi Urdu Lughat” by Tanveer Bukhari came out in 1989, while in the previous year, “Kalasiki Punjabi Lughat” compiled by Jamil Ahmad Paul was published. The largest and most comprehensive Punjabi dictionary was compiled by Sardar Muhammad Khan in 70s of the twentieth century, which is published in 2009. Another huge and reliable dictionary has been published by Iqbal Salah-ud-Din from Lahore. As mentioned earlier, Christian missionaries and English scholars were the first to pay attention towards the compilation of the rules and grammar of Punjabi. After them, this field of research remained largely unattended. In 1963, an Urdu booklet consisting of 96 pages, named “Qawaed-e-Punjabi” compiled by Muhammad Ali Faiq was published from Gujranwala. In 1972, Mirza Maqbool Baig Badakhshani compiled another grammar having the same name. It had 322 pages. In 1979, to meet the curricular needs of the time from Bahawalpur, Bashir Ahmad Zami brought out “Nakhlistan-e-Qawaed”. Abdu-ur-Razzaq Shahid published an academic booklet “Aasan Punjabi Grammar”. In 1981, Ghulam Yaqoob Anwer published his book “Bol tay Tol” which gives information about the Punjabi poetic genres and metrical structures. In 1984, Tanveer Bukhari and Muhammad Asif Khan jointly published a book “Kan Lekha” on the root words of Punjabi. Tanvir Bukhari’s book “Mahiya Fun tay Buntar” appeared in 1988. It is an important book on the art of Mahiya in Punjabi. Two more grammars were published in the year2005. The first of these was “Pothohari Grammar by Yasir Mahmood Quraishi” and the other was “Punjabi Grammar” by Karamat Ali Mughal. The compilation of “Heer Waris Shah” by Muhammad Afzal Khan in 1959 was the first major work done in the field of compilation. Later, in 1963, the same story was edited by Faqeer Muhammad Faqeer. Afterwards, Sheikh Abdul Aziz edited and compiled the same and completed the work in 1964. Among the innumerable versions of “Heer Waris Shah”, Sheikh Abdul Aziz’s compiled version is regarded as authentic. In 1961, Maulvi Ghulam Rasool’s “Ahsanul-Qasas” was compiled by the Punjabi Adabi Academy. In 1962, Muhammad Asif Khan, Khalid Lahori and Shahbaz Malik jointly compiled “Ajoki Kahani”. The poetry of Abdi Qaisar Shahi was published with the title “Yarnama” by Dr. Waheed Quraishi in 1963. Two years later, in 1965, Abdul Ghafoor Quraishi wrote a book comprising 128 pages, on the thought and art of Mohan Singh. During the same year the poetry of Sultan Bahu was published a new by Muhammad Afzal Khan. In 1966, Siraj-ud-Din’s compiled book “Gulzar-e-Shah Murad” was again compiled and edited jointly by Bagh Husayn Kamal, Riaz Chishti and Jamil Hashmi which was published with the title “Kalam-e-Shah Murad.” This book contains the Urdu, Punjabi and Persian poetry of the poet. In 1967, Dr. Waheed Quraishi wrote a comprehensive article named “A Survey of Punjabi language and Literature” in Pakistan Historical Society’s Journal published from Karachi. In the seventh and eighth decades of the twentieth century, Faqeer Muhammad Faqeer compiled the poetry of Baba Farid, Shah Muhammad, Hashim Shah, Ali Haidar, Muhammad Bakhsh, Bullhay Shah, Najabat, Hafiz Muqbal, Pilu and Hidayat-ul-lah, etc. and published under the auspices of Punjabi Adabi Academy. In 1970, Shafi Aqeel published an Urdu book named “Punjab kay Paanch Qadeem Shair.” In 1972, Shah Muhammad’s “Sikhan di War” compiled by Faqeer Muhammad Faqeer, was published by Muhammad Asif Khan with the title “Jang Hind Punjab.” During the same year, Muhammad Bashir Chaudhry compiled the poetry of Sultan Bahu. In 1973, Punjabi Adabi Academy published “Heer Waris Shah” compiled by Dr. Muhammad Baqir. In 1974, Hafiz Shah Jahan Muqbal’s “Jang Nama” was published by Dr. Shahbaz Malik with a new title “Jang Nama Muqbal tay Punjabi Marsiya.” This book also contains a critical and research based detailed analysis of the development of the genre of Marsiya in Punjabi during the past five hundred years. Ahmad Ali Sain’s poetry was compiled by Afzal Parvez in 1978. During the same year, the story of Heer written by Hafiz Muqbal was compiled and published by Hamid-ul-lah Hashmi. In 1978, the Siraiki poetry of Bedil Sindhi was compiled by Aslam Rasoolpuri and published by Bazm-e-Saqafat Multan. In the same year, “Kalam-e-Qadiryar” was compiled and published by Sharif Sabir and “Loak Tamashay” by Abdul-Ghafoor Darshan. In 1979, Hafiz Barkhurdar’s “Jang Nama” was published by Ahmad Husayn Quraishi Qaladari as “Jang Nama Imam Husayn.” In the same year, Hashim Shah’s “Kukaray” was edited by Hamid-ul-lah Hashmi. During the same year Khwaja Farid’s poetry was compiled by Noor Muhammad Faridi with the title “Diwan-e-Farid.” The “Jang Nama” of Peer Muhammad Kaasbi was published by Dr. Shahbaz Malik in 1982. With this publication, the history of Punjabi Marsiya went several years back. In the same year, Abdul Majeed Khan published “Iqbal di Hayati.” In 1987, the story of Sassi Punnu written by Hafiz Barkhurdar Musalmani Wala was published by Dr. Shahbaz Malik. “Kaal Bulaindi” of A. D. Ijaz is a landmark in the field of folk literature and it was published in 1983. During the same year, Pakistan Punjabi Adabi Board published Maulvi Ghulam Rasool’s "Ahsanul-Qasas” which had earlier been published by Punjabi Adabi Academy. The poetry of Baba Farid was compiled by Muhammad Asif Khan with the title “Aakheya Baba Farid nay.” Baba Farid’s poetry had already been published on a number of occasions such as “Shalok Bava Farid” (with Urdu translation,) “Shalok Farid” (Compiled by Muhammad Afzal Khan), “Shalok Farid” (Translated by Abdul Majeed Bhatti) and “Bol Farid” (Compiled by Faqeer Muhammad Faqeer). It was published in 1965 with Punjabi translation in prose. In 1988, by publishing the story of Sassi Punnu written by Hafiz Barkhurdar Ranjha, Dr. Shahbaz Malik proved the fact that Barkhurdar Ranjha and Barkhurdar Musalmani Wala were two different poets. In 1991, the Kafis of Bullhay Shah were published by Sharif Sabir with the title “Bullhay Shah Mukammal Kafian.” In the same year, Sayyed Afzal Haidar and Ameer Husayn wrote a book on the life of Baba Farid and Dr. Hafeez Ahmad brought out his book “Gwachay La’l”. In 1992 Muhammad Asif Khan wrote “Aakheya Bullhay Shah nay.” Later in 1994, he compiled and published the poetry of Baba Farid with the title “Aakheya Baba Farid nay.” Dr. Nasir Rana compiled and published the letters of Abdullah Malkhanwala, titled “Mulkhanwalay dian Chithian” in 2005. As stated earlier, practical research work in Pakistan was founded with the publication of “Punjabi Adab” by Muhammad Sarwar. Later, Abdul Ghafoor Quraishi’s “Punjabi Zuban da Adab tay Tareekh” was also published. Maula Bakhsh Kushta, Shafi Aqeel and other such intellectuals further promoted research work in the country. In 1958, Sharif Ahmad Sharafat Noshahi founded four prose sermons of Nosha Ganj Bakhsh and published them as “Mavaez-e-Nosha.” In 1972, Yusuf Tahir compiled and published the story of Sassi Punnu written by Haji Muhammad Safoori. In 1973, Sharafat Noshahi discovered another sermon of Nosha Ganj Bakhsh and, thus, increased their number to five. In 1978, Ismat-ul-lah Zahid discovered another sermon and published it along with the earlier five sermons as “Aakhay Nosha Qadri.” “Sharif-ut-Tawarikh” is another worth mentioning book of Sharif Ahmad Sharafat. From part one to part seven and in part ten and part eleven, he has mentioned those Punjabi poets who are related to the Noshahi school of thought. The same researcher has separately published the poetry of Nosha Ganj Bakhsh. However, it is highly objectionable due to mistakes in relativity. Iqbal Salah-ud-Din’s “Fehrist-e-Maqalat” published in 1984, is regarded as a reference book. In 1984, the same researcher published “Fehrist Punjab Nasri Takhliqalat.” Abdul Hameed Mohsin’s bibliography “Pakistani Punjabi Afsana” and other bibliographies published in the six monthly “Khoj” are also important. The monthly “Lehran” and the six monthly “Khoj” Lahore have also published the bibliography of their old issues. “Pakistani kitabiyat” by Dr. Shahbaz Malik volume-1 is another bibliography published from Islamabad in 1991. It informs about twelve and a half thousand Punjabi books which have been written in the Persian script. Previously, he had given initial information on this subject through his master’s level thesis which was published in the first and tenth edition of the magazine named “Khoj”. Later, it was published in the form of a book “Pakistani Punjabi Adab” in 1985. “Punjabi Kitaban” by Sibtul-Hasan Zaigham (1973), Ubaid-ur-Rrehman’s “Siraiki Kitabiyat” (1979) and “Siraiki Kitaban” (1988) were also present. However, “Punjabi Kitabiyat” published in 1991, gave finishing touches to the already available information. Dr. Nasir Rana’s book “La’lan day Wanjaray” published in 1998, enlightens important poets from research point of view. Criticizing the poetry of Siddiq Lalli, Ahmad Yar remarks that the mystical element is dominant in his story of Yusuf-Zulaikha, but besides this element, there is nothing worth mentioning in his poetry. He concludes that lalli is neither a good story teller nor a good poet. He states that he has written excellent poetry which is read with great relish and delight by the youngsters. He challenges and invites all the other poets that they are free to criticize and examine his poetry, if they desire so. Such boasting claims of Waris Shah were later on refuted by Maulvi Ahmad Yar. Commenting on this subject Dr. Shahbaz Malik writes that Maulvi Ahmad Yar was a representative of theoretical and practical criticism at one and the same time. Maulvi Ahmad Yar as a critic, wrote about the poetic art of Pilu, Hafiz Barkhurdar, Siddiq Lalli, Muqbal, Ahmad Shah Abbasi, Waris Shah, Ali Haidar, Sultan Bahu and Haji Muhammad Safoori, etc. (19) Like Waris Shah, Ali Haidar also expressed his opinion about his own poetry. At different points in his poetry, he has enumerated a number of rules of criticism. This aspect of his writings becomes evident from his stories of Saiful-Mulook and Sheikh sana’n. He has expressed his critical opinion about as many as seventeen poets. It is interesting to note that Mian Muhammad Bakhsh has strongly criticized Maulvi Ahmad Yar who had condemned the element of self-exhibition in the poetry of Waris Shah. This critical approach is also found in the poetry of Maulvi Muhammad Husayn Ahmad abadi (1858-1919). Thus, in his translation of “Diwan-e-Hafiz” while examining the meaning of a couplet, he points to the subtlety and delicacy needed for comprehending the intended meaning of such poetry. Munshi Ghulam Husayn Kelianwala can also be included in the list of those poets who were critics as well. His critical approach is reflected from his story “Dhol tay Shams”. Some people raised the objection that he was writing fictional stories in spite of his apparently religious tendencies. Responding to such objections he writes that moral principles cannot be applied to the truths and lies narrated in the forms of the stories of fiction, because, they are only meant to make the people understand certain things. By means of their fictitious poetic literature, poets attempt to guide the misguided humanity towards the right path. In this way, the fictional style of the stories cannot be described as a lie. His critical vision again displays itself when at the end of his story of Bilal he points out the fact that he is using a new meter for the first time in Punjabi poetry. The above discussion clearly reveals that Punjabi criticism had begun earlier than Urdu criticism. Criticism in Urdu began with Meer Taqi Meer’s biographical book “Nukatus-Sho’ra. Meer was born in 1725 and died in 1810. Almost half a century ago, the eminent Punjabi poets for example Waris Shah (died in 1792) had started paying attention towards this field. The traditional oriental criticism has been based on prosody (Metrical structures), narration, rhetorical devices and meanings of words, etc. But as a matter of fact, the leading representatives of knowledge and literature in Pakistani Punjab did not have the real knowledge of local metrical structures. Writers have always been of the view that while a great piece of literature is being created some of the hard and fast rules devised by the critics are bound to be ignored. It is also a fact that attempts to measure the popular and great classical literature with the yardstick of the rigid technical and critical rules will often end up in disappointment. In the same way, if too much attention is paid to the rules, standards and experiments, the art is endangered. Thus, in spite of the fact that the poetry of the Punjabi Sufi saints is classical and extremely popular, it does not come up to the strict technical and critical artistic standards. While compiling the poetry of Shah Husayn, Bullhay Shah and Baba Farid, Dr. Nazir Ahmad emphasized on this aspect of their poetry. However, when his books reached the libraries instead of appreciating them, scholars criticized them and argued that compilers do not have the right to make their own additions and omissions in their attempts to bring the classics in conformity with the demands of the art. In the same way, modern lyrical poets such as Bashir Aabid, Ikram Majeed and Bashir Bava attempted to conduct technical experiments in their poetry. But their thoughts were drowned into such experiments. Meaning of words, narration, rhetorical devices and prosody are the traditional principles of criticism in the East. Seen in this context, the main themes of this type of criticism are: synonyms, idioms, language of the daily use, eloquence, rhetoric, comprehensiveness, brevity, equality and omission, etc. Before the introduction of the Western critical approaches, Eastern literature was evaluated on the basis of the above mentioned principles. Even today, these principles are found parallel to them, individually, or jointly with the Western principles. When in the twentieth century, criticism began in Punjabi prose; Western critical principles were used along with the Eastern critical principles. It has already been pointed out in the previous pages that research and criticism are hand in glove with each other in Punjabi and, therefore, while giving a detailed account of critical books, we shall mention a number of those books which have already been referred to in the list of research books. The foundation of criticism in Punjabi prose was laid by Bava Budh Singh, who was an engineer by profession but had a keen interest in literature as well. Four critical books written by him were published one after the other. The first of these “Hans Choag” was published in 1913. “Koel Ku” came out in 1916. “Bol Banbiha” appeared in 1923. The last of these books was “Prem Kahani” that was brought out in 1926. “Prem Kahani” which discusses the life, art and thought of fifteen classical Punjabi poets is the most important of these four books. Later, “A History of Punjabi Literature” by Mohan Singh Diwana was published probably in 1933. In 1938, Oxford Press published “Punjabi Sufi Poet”: by Dr. Lajwanti Rama Krishana. It was the thesis written by him for D. Lit. In 1941, Dr. Banarsi Das Jain’s “Punjabi Language and Its Literature” was Published. “Punjabi Laikh”, a critical book for curricular references, was published in 1945. After the creation of Pakistan, criticism began to attract the attention of the scholars. Muhammad Sarwar’s “Punjabi Adab” can rightly be described as an important land mark in criticism. 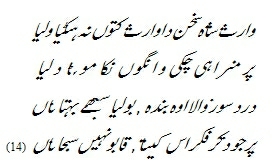 Afterwards, “Punjabi Zuban da Adab tay Tareekh” by Abdul Ghafoor Quraishi was published in 1956. “Punjabi Shah Paray” by Sultan Mahmood came out in 1959. 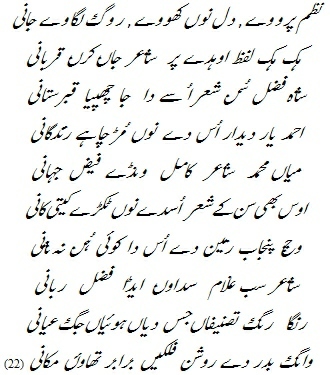 Later, in 1960, “Punjabi Shairan da Tazkra” was published by Maula Bakhsh Kushta. For the first time in this book, biographical details of around three hundred Punjabi poets were given along with the specimens of their poetry. Two important books were published in 1962. They were: “Punjabi Zuban kay Shah Paray” by Loha Kutt and “Punjabi Zuban-o-Adab” by Shamim Chaudhry. In the same year, the September and October editions of the monthly magazine “Punjabi Adab” carried “Punjabi Adabi Tazkrian tay Tanqeedi Nazar” by Dr. Ahmad Hussain Qaladari. This combined edition of the magazine was issued as “Criticism number” and it was the first formal critical review by Qaladari. Through this critical evaluation of earlier biographical, historical and critical books, an attempt was made to re-establish the standards of criticism. The same critical analysis was published in 1975 in the form of a book, in Urdu, named “Punjabi Adabiyat ka Tehqiqi Mutalea”. After this, Akhtar Husayn Akhtar wrote a book “Khilray Moti” to meet the curricular needs. Meanwhile, in 1972, Abdul Ghafoor Quraishi re-compiled his book “Punjabi Zaban da Adab tay Tareekh” and published it as “Punjabi Adab di Kahani.” In the same year Hameed-ul-lah Hashmi published his “Punjabi Adab di Mukhtasr Tareekh.” In the mean time, new trends and themes of criticism began to be introduced in Urdu and English. The following critical books appeared in Urdu. “Punjabi Zuban day Shah Paray” by Loha Kutt, “Punjabi Adab” by Muhammad Sarwar, “Punjabi Adab ki Mukhtasr Tareekh” by Ahmad Husayn Qaladari, “Dhani Adab-o-Saqafat” by Anwer Baig Awan, “Punjabi Adab-o-Tareekh” by Shamim Chaudhry, “Siraiki aor us ki Nasr” by Dilshad Kalanchvi and “Waris Shah” by Maqsood Nasir Chaudhry. The worth mentioning critical books published in English were: “Recurrent Patterns of Punjabi Literature” by Najm Husayn Sayyed ,”Qadir Yar a Critical Study” by Athar Tahir and “Source Material of Punjabi” by Malik Ahmad Nawaz. The following Punjabi critical books played a significant role in promoting theoretical and practical criticism in Punjabi. 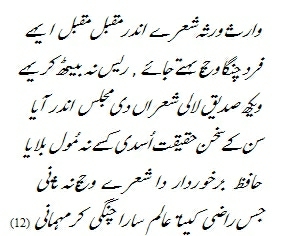 Sharif Kunjahi’s “Jhatian”, Dr. Sarfraz Husayn Qazi’s “Tasavvuf tay Punjabi Shairi”, “Waris Nira Waris”, “Mithal Farid”, “Lok Geetan da Fanni Tajzia” and Navin Nazam”; Abdul Hameed Sarshar’s “Adabi Rashman” and “Adabi Challan”; Dilshad Kalanchvi’s “Tanqid dian Poorian”, Dr. Aslam Rana’s “Adab Kahani” and Siddiq Babar’s “Vichar Laikh” are specimens of theoretical and practical criticism. In the same way, “Gaver”, “Nataray” and “Azadi day Mujahid Likhari” by Dr. Shahbaz Malik, “Soach Vichar” of Dr. Hafez Ahmad (1990), “Pir Farid” by Hameed-ul-lah Hashmi, “Pareet Muhar” (Urdu understanding of Khaja Farid’s Kafis) and “Kon Farid” by Dilshad Kalanchvi, “Farid ton Kashir tak”(1988), “Rangan wichon Rang”(2004) and “Pakistani Daor di Tehqiq tay Tanqid” (2006) by Dr. Nasir Rana, “Rang Sang”, “Adab Kahani” “Yar Farid” and Ramz Rivayat” by Dr. Aslam Rana and “Wairway” and “Navain Zaviye” By Dr. Akhtar Jafri. Both Eastern and Western critical trends and approaches are found in these books. From this brief detail of the critical work done in Pakistan, it is quite evident that Punjabi criticism has defined its directions and trends in a very short span of time. Now, it is passing through the stages of development in the hands of serious and mature writers.